I don’t think I’ve ever gone to bed with makeup on. Not to say I wasn’t tempted on occasion, getting home after a long night out, for instance. I guess it has something to do with my OCD-like tendencies when it comes to cleanliness. However, I do have to say that as much as I love skincare, I sometimes get juuust a bit lazy with my nighttime routine. This is why my bedside table is a home to quite a few skincare bits. 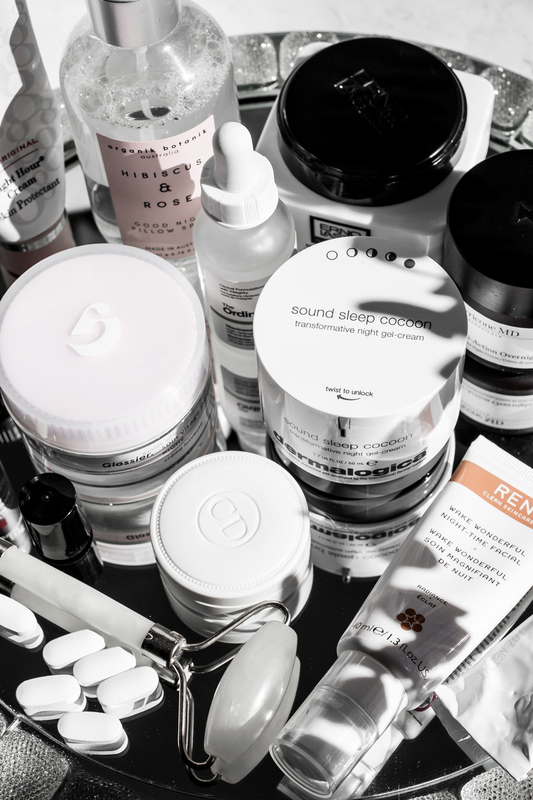 It’s all about easy access- if my favorite treatments and moisturizers are within my reach, then even when I’m terribly exhausted, I allow myself to indulge a little. Do you ever give your beauty products a second chance? 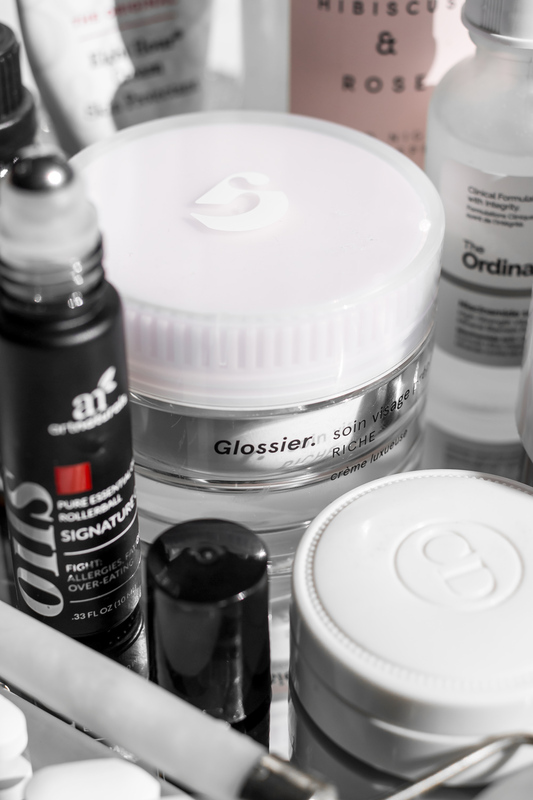 When I first got my hands on Glossier’s Priming Moisturizer Rich, I was outraged at the claim that this is a “luxurious face cream.” I’m talking about red blotches all over my skin, dry patches, itchy. It was a mess. Then, I decided to give it another try once I got off Accutane and boom. My skin no longer had a negative reaction to it, and actually liked it quite a lot. Since then, it earned a permanent spot on my nightstand. Hyaluronic Acid is a godsend for my dry skin and I always use it before creams and moisturizers (both day and night). 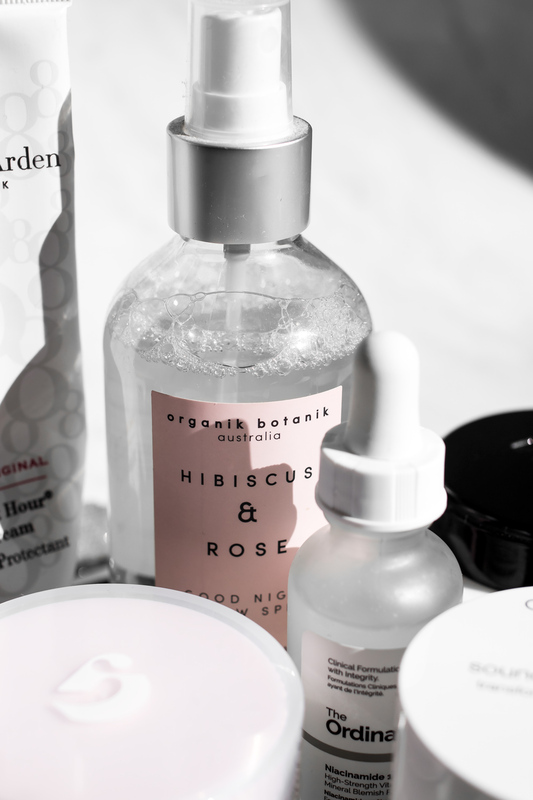 It’s one of those products where you don’t have to overpay- I’ve used both very inexpensive, no-brand HA serums and $50-a-bottle ones, they all worked the same. Currently, I love the TO’s version. Of course, lip balm is another must. My bedside favorites are Elizabeth Arden’s 8 Hour Cream and Dior’s Creme de Rose. Both are such classic products, and they never disappoint. 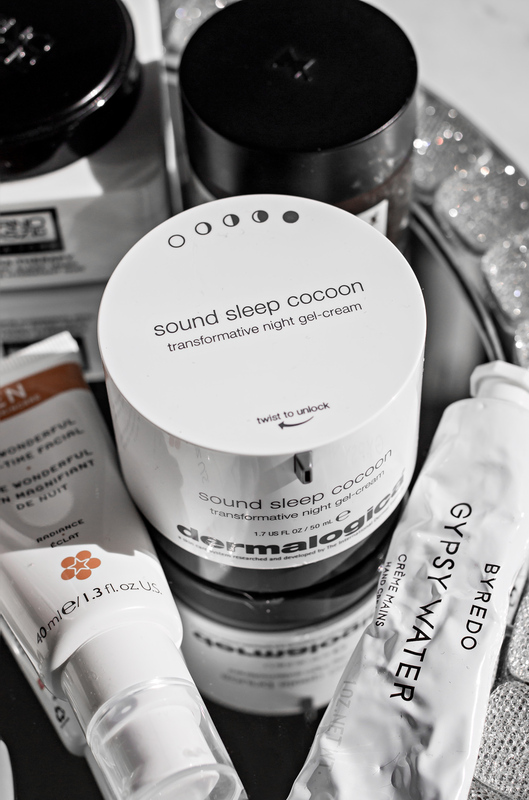 The newest addition to my bedside beauty table is Dermalogica’s Sound Sleep Cocoon. * I received it from Influenster a couple of weeks ago and I’ve been enjoying it quite a bit. It’s very lightweight, has a gel-like formula and absorbs nicely. Probably not the best option for someone with skin as dry as mine, as I don’t find that it alone helps with my dryness. Also, the packaging is very cool looking, but I’m wondering how will I know when I’m running out of product, and how much product is actually in there since it’s quite bulky. I think that normal to oily skin types would really dig this. REN’S Wake Wonderful Night-Time Facial is a great acid treatment to reach for when I’m too tired for an AHA wash-off mask. With this, you just apply it and leave it on overnight. It exfoliates, brightens the skin and is an overall great product. The only thing I don’t love is the scent, but that, thankfully, does not linger at all. And, I mean, of course, the one product I’ve been constantly talking about for the last few months is Erno Laszlo’s Hydra-Therapy Memory Sleep Mask. My absolute favorite nighttime treatment. 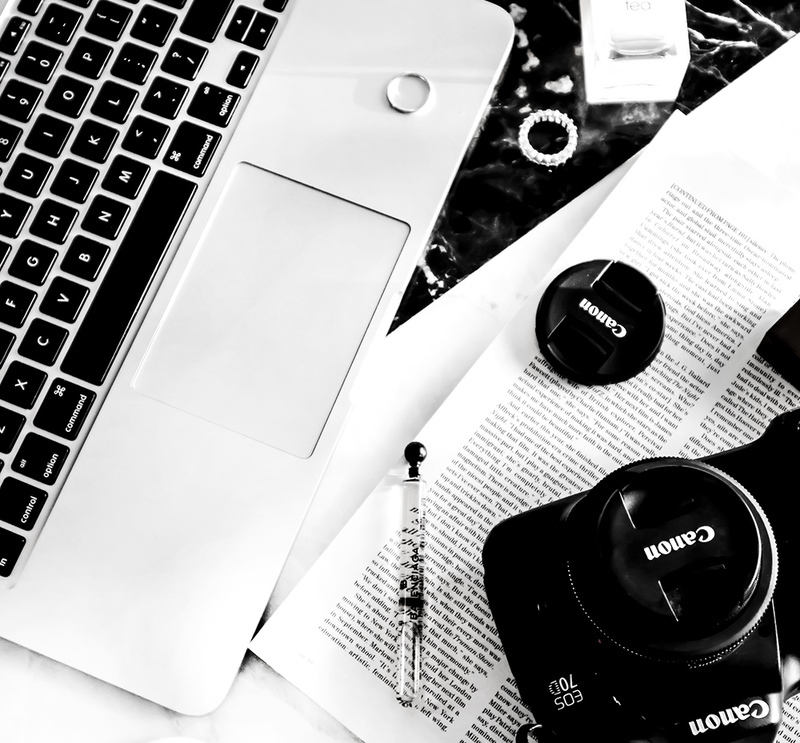 It’s lightweight, oil-free and gets the job done very well. It feels incredibly luxurious and worth every $90-per-jar drop. Love this stuff. My other bedside essentials are magnesium, essential oils, and pillow mist. Magnesium oil is also great for sore muscles and helps them relax after a long day. These all are very helpful when it comes to maintaining a good sleep cycle. I’ve struggled with sleep for a while, and I find that unwinding before bed, having little rituals, helps me put my mind and body at ease.